SeaWorld's new Manta roller coaster opened in May 2009 with an official grand opening day on Friday May 22 (Memorial weekend) but some guests were able to ride it ahead of this date with a soft opening in early May. Following a teaser announcement during the official opening of Aquatica in April 2008, SeaWorld gave further details in late May 2008 of their new themed attraction and roller coaster planned for SeaWorld Orlando. Called "Manta, Ride the Flying Ray", the new attraction is SeaWorld's second real roller coaster to complement Kraken and the part coaster/part water ride Journey to Atlantis. The new Manta attraction is in two parts, a themed village environment housing a large number of tropical fish and rays and a state of the art roller coaster ride. SeaWorld have coined the phrase "from seeing to being" to emphasise how you can view the beauty of how rays swim in the water and then experience the same type of flight yourselves on the roller coaster. Note that if you don't want to ride the roller coaster you will still be able to enjoy seeing the rays. Set in a mythical village celebrating the legends of rays, the queue lines will be decorated with ray inspired art work. A series of aquariums will then give the visitors amazing views of around 2,500 tropical fish and some 300 rays of various kinds including Shark rays, Spotted Eagle rays, Leopard rays, Cownose rays and Oscillate River rays as well as other unusual sea creatures like Sea Horses and Sea Dragons. There is also an overhead viewing panel where you will be able to watch rays circling overhead. All told there is some 184,000 gallons of water in ten aquariums and a lagoon. 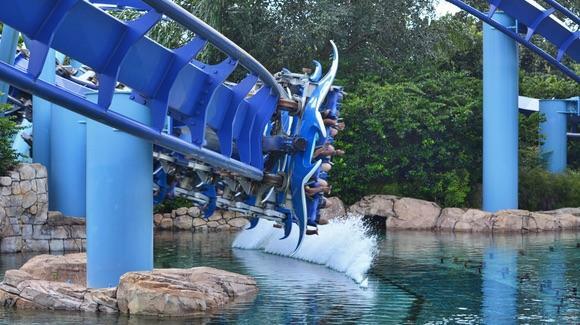 The Manta Ray ride is one of only a few flying roller coasters, the first to be built in Florida and will give the riders the sensation of swooping and gliding like a ray. After you get onboard, the seats rotate you into a prone face-down position unlike traditional coasters where you sit face-up throughout the ride. The cars are shaped like a Manta ray with a twelve foot wing span and hold 32 guests. Manta reaches speeds of 56 mph with four inversions and spins including two in-line spins, a flat spin and a pretzel loop, a close call with a waterfall and a wing dip just inches above the water. In fact the water fall separates the queue line from the ride and you'll be able to feel the train as it hurtles past. The 3,359 feet of track includes a 113 foot drop and takes the riders only inches above the surface of a lagoon as it skims across the water. The 140 foot high coaster has been built close to the park main entrance on a seven acre site including the former flamingo habitat. It is painted in shades of dark purple, ultramarine blue and cobalt. Height requirements are 54 inches (137 cms). The roller coaster has been built by the renowned Swiss coaster design company, Bolliger & Mabillard who also built Kraken at SeaWorld, SheiKra, Kumba and Montu at Busch Gardens and Duelling Dragons and the Incredible Hulk Coaster at Universal's Islands of Adventure.